I am thrilled to be a guest blogger! My name is Kara Hoelscher, and I am currently a second grade teacher at a small rural school in Texas. I have taught several grades throughout my 13 years of teaching, but my heart truly belongs in the second grade! Blogging is fairly new to me. You can find my teaching blog at Little School on the Range. I’ll be honest: When I first read about Personal Financial Literacy being added to the new standards, I was puzzled as to how to tackle the subject. However, after I read through the standards, I realized that they were pretty reasonable. The standards require us to teach about savings, borrowing, lending, and making deposits and withdrawals. The main problem that I faced was how to fit them into our already busy schedule. After a lot of thought, I thought that these standards would serve as a much needed review of money and basic math operations. Money is something with which my second graders really struggle. 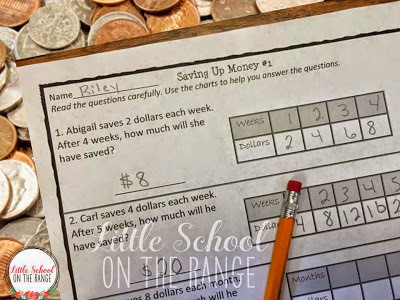 It seems that the new standards seem to brush over them quickly, and my students don’t quite master the concept of counting money as well as I would like. 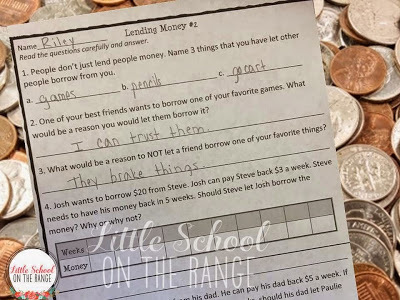 We began our Personal Financial Literacy with a basic money review. We started with dimes and pennies (to reinforce the tens and ones places) and moved on to other coins and dollar combinations. We first covered money early in the year, and this was a much needed review! We then moved on to discussing saving and spending. 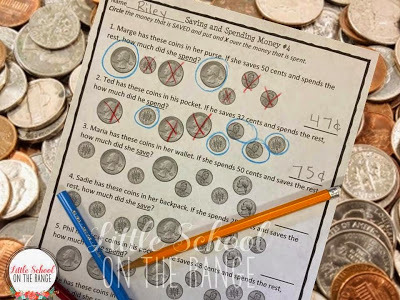 We used coins to do this (continuous money review). We crossed out what was spent and circled what was saved. I really like letting my kids cross out the money spent in red. This just reinforces accounting concepts that they will learn later down the road. We used charts and looked for patterns when calculating savings over time. This is a great way to integrate our charts and graphs skills from earlier in the year. It also allows us to look for recurring patterns, which is always important in math. 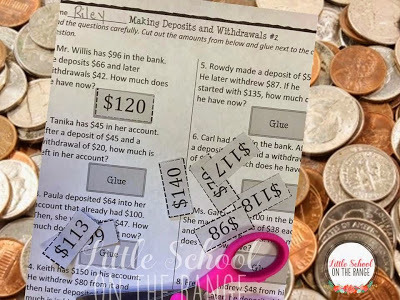 Calculating savings also served as a way to practice our skip counting, which will help us later in the year as we face learning multiplication. The terms deposits and withdrawals were new for all of my students. As teachers we have to remember that all of our students may not be coming from homes with bank accounts. Some of these terms and ideas are new concepts for many of our students. That is why it is so important that we teach them to our students at an early age. 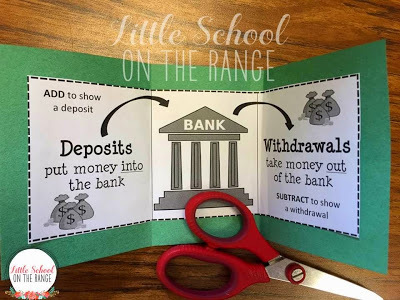 In order to remember these terms, we made a foldable picture to serve as a visual reminder of the difference between a deposit and withdrawal. We put it into our math journals to serve as future references. This foldable picture is available in my freebie below. Bobby had had $140 in the bank. If he withdrawals $50, how much is left in his account? These are skills that will lead students to being able to balance a check book and maintain bank accounts in later years. What things have you let people borrow? Why would you let people borrow those things? Why not? What makes a person a good borrower? What makes a person a bad borrower? Why do you think a bank would consider a person a good borrower? Why do you think a bank would consider a person a bad borrower? What would lead you to think that a person would pay you back money? What would lead you to think that a person would not pay you back money? Like any new concept that you are teaching for the first time, it is important to really think about what the students need to take away from the lesson. 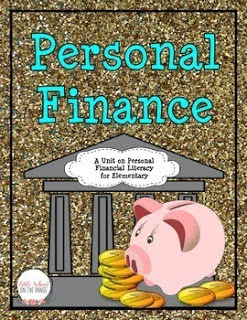 Although the concept of personal financial literacy first seemed to be difficult to teach, once I broke it down and brought it down to my students’ level, it was a beneficial unit. Like any unit, the key was to make sure that I reinforced previously learned concepts throughout the unit and to make sure that they could relate the concepts to their everyday life. 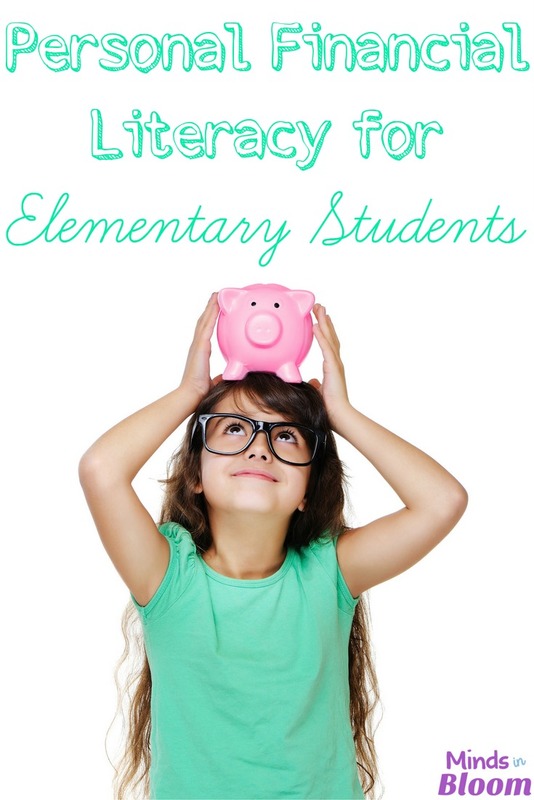 This FREEBIE is a great way to begin your Personal Financial Literacy unit! I hope that you can use it in your classroom!